Hi everyone! It's time again for another challenge! This week we have picked a colour theme, 'Red, Black and White'. You can interpret this in anyway you want to and make what ever you want. We hope you have fun taking part. Congratulations to, Rainbow Lady and mueppi you have won last weeks prize a beautiful Hanna stamps each! Card I masked the bird on the stamp then inked up the stamp with black ink, removed the mask and added red ink to the bird only, then stamped this onto white card. I mounted the stamped image onto white card and positioned this on the black card base. Using white ink I stamped swirls to the top & bottom of the base card then highlighted with clear glitter glue. Finally I used clear glaze on to the bird to make him stand out. I covered my card in DCWV patterned paper, stamped an image and embossed the outline, then coloured in the red parts with an embossing pen and clear embossed those too. This was matted onto the card, with a message, and then I stamped 3 flowers and coloured and embossed in the same way, cut them out and added them to the side. 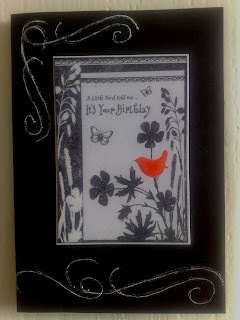 The challenge of My Time To Craft this week was to use the colours Black, White and Red on a card! 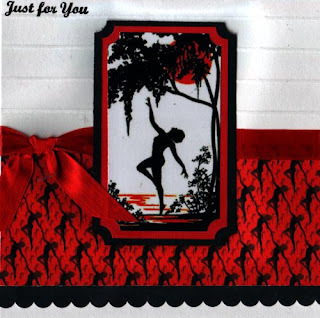 This has to be one of my favourite colour combos and I have been waiting for a chance to use this image from the Joanna Sheen Dancing With Shadows CD!. The backing paper is also from the CD. Embellished with Red stain ribbon and a 'Just for you' greeting. 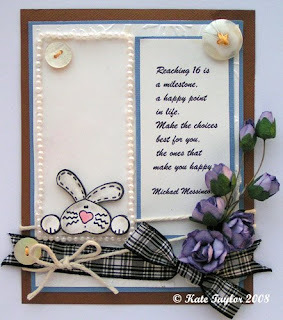 For this weeks challenge I stamped the background with a small floer stamp. 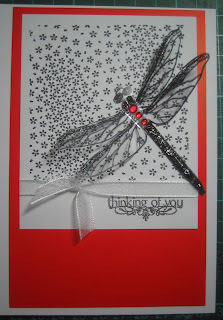 Then I stamped a dragonfly designed by Linda Luckin onto acetate and added black stickles to the wings. I then added a piece ribbon and a few words. I mounted it all on red card. Finally three red gems were added for the dragonflies body! 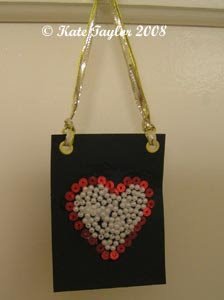 I made my tag using black cardstock, red & white beads and a gold ribbon. I drew a hart shape and then stuck on lots of beads. The ribbon has been secured with 2 eyelets. This weeks challenge has been postponed until next Monday. Jo, Wendy, Becky, Lesley, Fifi and Kate. We hope you have fun taking part, Happy crafting! Congratulations to, Pauline, Nessy , Jose , Sam21, Sammee, Kathleen, Tinkerbell, Angela, Andrea and Joanne you have all won last week's prize - 10% off at Handy Hippo. Please email us your details. 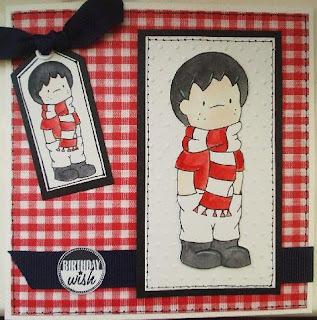 This week's Prize, supplied by is 'Craftaway' - are 2 beauitful Hanna stamps. Everyone who takes part in this week's challenge by (10pm Monday the 21st of July GMT) will be entered into a prize draw and 2 lucky peoples names will be selected at random, each winning 1 stamp each!! 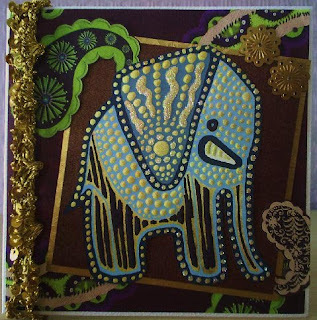 I cut out a glittery elephant from a scrapbook sheet designed by Carol Wilson and matted him onto brown card stock. I placed this onto paisley patterned paper and cut two of the paisley patterns out for decoration. I then added some authentic Indian braid and two gold sequins. 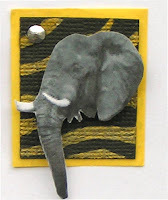 For my inchie, I used a clipart image of an elephant and Black & yellow cardstock. I drew some animal markings with a gold metalic sakura pen & added a little silver sequin. 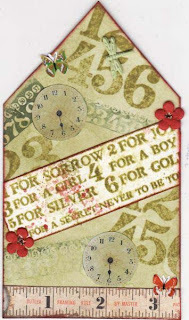 For my card I have used Tanda Stamps Far East Set 3. I have made a background piece by stamping various images and embossing with silver onto a blue card stock. I have stamped the main image in a matching blue dye ink and stippled ink around the edges with a brush. This piece was then popped through a paper ribbler, matted onto blue card stock and embellished with silver cord and a stamped coin. I stamped some Kanji directly on the card base in red. This week I started making an atc but it turned into this card! All stamps I have used are from Tanda Stamps. 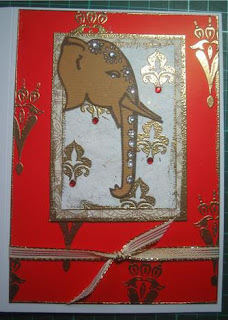 I stamped the elephant with versafine Vintage Sepia then added white gell pen and gems to his head dress. I then embossed all the other images in gold. I covered the skinny with patterned papers and stamped some images on the right hand side and also on a small piece of moutboard and attached on to the ribbon. 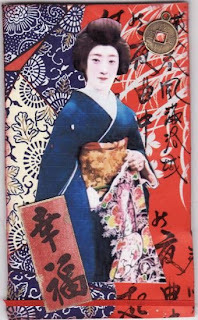 I used a free image from Art-e-Zine of an oriental lady, and added a coin to embellish. 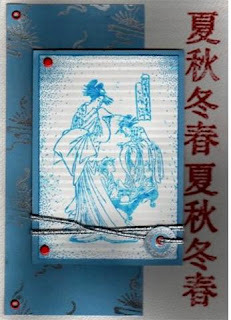 Using versamark ink I randomly stamped the Chinese symbol over the base card. 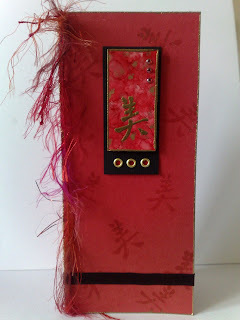 On a piece of stampboard I made a red & gold background with alcohol inks and then stamped and embossed the Chinese symbol in gold and edged the piece in gold too, I added 3 small red gems to the top corner. The stampboard was then mounted on to black card with 3 gold eyelet's set at the bottom, which was then mounted to the base card. I attached a black ribbon to the bottom and finished off with some red fibres. Hi everyone! Thankyou for taking part in last week's challenge. It's time for a new challenge and the theme this week is 'Numbers'. 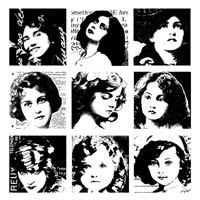 Perhaps make a Card, Tag, ATC, Skinny, Scrapbook page, Fatbook Page (4x4) Gothic Arch, Moo Mini card, Skinny, Inchie or Altered art. Leave us a link to your blog so everyone can see what you make! Congratulations to Joanna you have won last week's prize - One Tilda Stamp! Please email us your details and we will post you your prize. 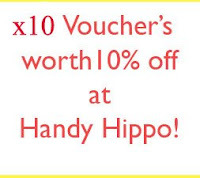 In this week's Prize draw, supplied by Handy Hippo, we have x10 vouchers worth 10% off for their online store! Everyone who takes part in this week's challenge by (10pm Monday the 14th of July GMT) will be entered into a prize draw and 10 names will be selected at random. We will announce the winners next week. 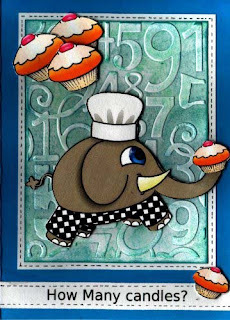 My Numbers card uses a Cuttlebug background. I have added chalk inks directly to the negative side of the Cutlebug folder, popped in my white card and embossed. The images come from the Card Toonz Professional Nuttyness CD. Faux stitching detail and a computer generated text ribbon finish the card. 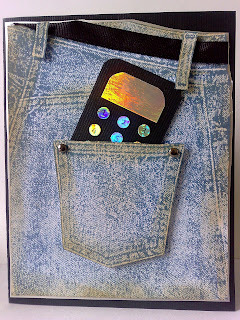 I stamped the jeans pocket twice and decoupaged the pocket and belt loops. I added ribbon through the belt loops and brads to the pocket. I distressed around the edges and mounted it onto silver card then onto a black card blank. For the mobile phone, I cut a rectangle of black card and rounded all the edges, then using silver mirror card I cut out a rectangle for the screen and rounded two of the edges then punched out 9 small circles to which I wrote numbers 1 - 9, then assembled it and popped it in the pocket. I cut out a house, and inked it with Peeled Paint Distress Ink. I added a strip of tape measure paper and stamped various background stamps containing numbers. I cut out a couple of clock faces and stamped the main saying (by Paper Artsy) and added some Primas, butterflies and a brad to finish off. I made my card using blue and brown cardstock and added a verse about being 'Sixteen'. I watercoloured my Bunny stamp - by Bootiful Stampz - and embellished with some pearl beads, flowers, black check ribbon, buttons and string. 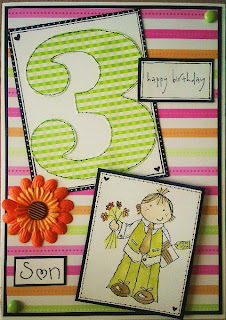 I traced around a template onto patterned paper to create the number 3 and the added some faux stitching detail. I also stamped Birthday Hamish and coloured him with Distress Inks. 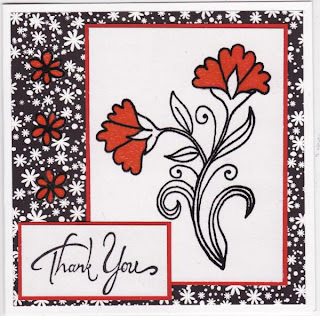 I finally added some doodling, Prima flowers, Dovecraft brads, a Penny Black sentiment and Doodlebug rub-ons. 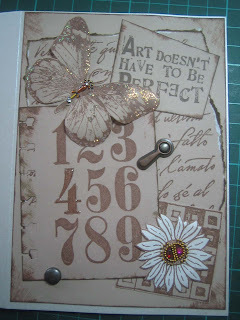 For this weeks challenge I started with the paper artsy number stamp. I stamped it with brown versafine then punched the edge with a stampin' up bind punch and inked the edges. I stamped lots of other images using the same ink and inked all the edges. The daisy was then stamped onto white paper and cut out - bindis have been added to the centre. The butterfly has been made to sparkle with stickles and a bindi body. I finished it off with a phototurn and a couple of brads.